One of the most neglected parts of the home is the roof. That’s because homeowners are usually so pre-occupied with other parts of the property that are in their face demanding attention all the time, such as keeping up with the landscaping. But it’s a big mistake to neglect your roof – one of the biggest investments you can make as a homeowner. Sure, yard work should be high on your priority list, but so too should your roof. While the weather is nice, now’s the time to inspect your residential roofing system; better yet, have a professional do it for accuracy and safety. Here are a few tips to keep the roof over your head in pristine condition this summer. Over the course of several months, leaves, debris and dirt can build up in those gutters and pipes. If you allow them to continue to build up, this can block the flow of water and lead to flooding. This is a good time to clear out the debris just in time for those severe summer storms. If you have skylights in your home, you’ve probably noticed leaves and debris building up behind the windows. Leaving that debris there can cause moisture to become trapped beneath, leading to algae, decay and mildew. Remove this buildup at the start of each season. 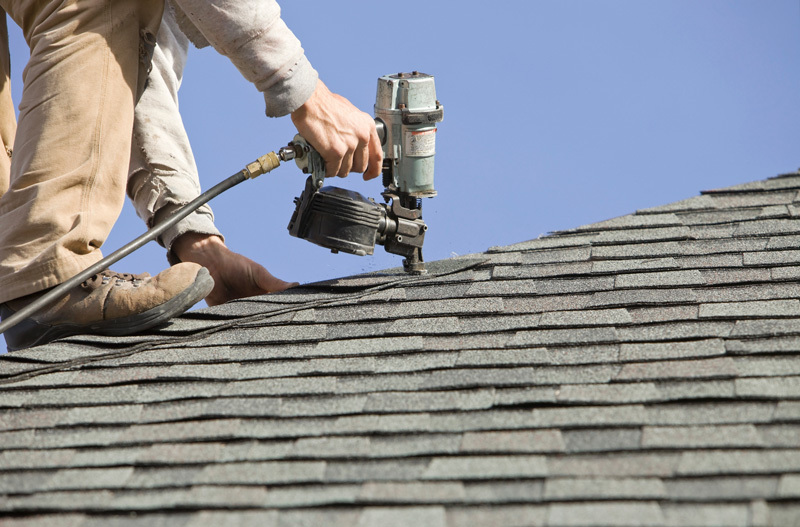 If you have any missing or damaged shingles, replace them right away. It’s perfectly normal for your shingles to crack or fall off, especially in intense heat. You can replace each shingle individually, which will help to ward off any leaks that can cause real damage to the interior. While there, examine any eaves and overhangs. If you see water stains, you may have a leaky roof. While inspecting your roof, it’s a good idea to take photos at different angles. This is for your records but can also be used to show your roofer if you find an issue as well as for your insurance company if the need arises. Compare these pictures year after year so you can see if there have been any major changes. If you notice algae overtaking your roof, you should act immediately to get rid of it. You can pressure wash it or call your roofer for more specialized removal services. Raccoons, mice, rats and squirrels all like to call attics home. Inspect your roofline for any holes that critters can squeeze through and then seal them up. If an infestation has already happened, call a pest control company to ensure you get the problem under control immediately. Taking care of your roof should be high on your list of priorities. Notice any issues that just don’t look right? Did that last summer hail storm do a number on your roof? Always call your trusted roofer about anything that compromises the integrity of your roof. To learn about our roofing inspection services, please contact us at 817-440-3062 or fill out our online form.